Those of you who have been following my blog for some time understand I have been dealing with autoimmune issues as well as fibromyalgia and chronic fatigue for over 16 years. Dealing with fibromyalgia flares or autoimmune disease flare-ups can be difficult when you are trying to raise a family, maintain a marriage or even hold on to friends of many years. The problem is many people just don’t understand the seriousness of the disease and as far as they can tell, you look okay to them. Great that we look okay, but honestly having an invisible disease is not so wonderful. That is because people are quick to assume, incorrectly of course, that we are just lazy, and not willing to work or just don’t want to hang out with friends. Gee, let me think. If I could choose between hanging out with friends for a fun night on the town or curled up in the fetal position in bed screaming out in pain, which would I pick? Which would you pick? Well, of course we would not pick to be in that kind of pain. Problem is, fibromyalgia, chronic fatigue, and many autoimmune diseases are misunderstood by the public. So, we suffer in silence. Over the years I have been to so many rheumatology appointments I can’t even count. I have pretty much tried everything within reason my doctors recommended, some with disastrous consequences. After that I started researching every medication and became my own advocate on figuring out how to get better. Somehow I know I am not the only one struggling with this. I got to the point that I was grasping at straws for anything that might help me lessen the pain just a little or have something close to a normal quality of life that was not going to medicate me and put me in a zombie like state. I mean I have three kids, a husband and still have goals and dreams. I wanted to be there for my kids, my husband, my family, my parents, my church. There are still things I want to do in this life, so laying at home in bed all day screaming and moaning in pain does not make my top ten list of things to do. According to MedlinePlus, “There are more than 80 types of autoimmune diseases, and some have similar symptoms. This makes it hard for your health care provider to know if you really have one of these diseases, and if so, which one. Getting a diagnosis can be frustrating and stressful. Often, the first symptoms are fatigue, muscle aches and a low fever. The classic sign of an autoimmune disease is inflammation, which can cause redness, heat, pain and swelling. Eating lots of antioxidants is an important way to reduce inflammation. So instead of going on about how bad life can be, how about I share all the things that are working? I have tried chiropractic which I believe does help to some extent especially if you can find a chiropractor who is willing to offer a monthly wellness plan so you can afford to go weekly. Many chiropractors are switching to this and bypassing traditional health insurance all together. Thankfully my chiropractor, Dr. Benton at Suncoast Chiropractic in Port Charlotte FL offers a plan for just $69 a month. If you are local, check him out! Changing my diet has helped as well. As far as dieting, yes doctors tell you to lose weight but I learned from other fibro friends that the weight never seemed to make a difference as far as the symptoms we experience with our illness. It seemed to matter more what kind of foods they were eating and how healthy they were. So I focus on the health and less on the weight. Seems to be working out well as I have lost weight and have less of the severe flares that are difficult to live with. I stopped eating processed foods and artificial sweeteners, also got rid of high fructose corn syrup out of the kitchen cabinets and pantry at our house. I really started reading the labels and stopped drinking soda. 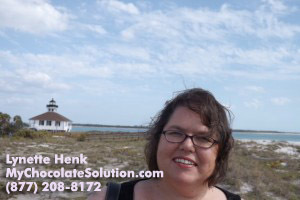 was about eight years ago now that I first found out about healthy chocolate at a health food store in the Port Charlotte North Port Southwest Florida area. It was explained to me that the chocolate was not heated or dutched like candy so that it keeps in the antioxidants and flavonoids from the raw cacao that real pure chocolate is made from. This beyond chocolate also does not have waxes and fillers like the candy chocolate plus no processed sugars. Also great for those that are going gluten free, want diabetic friendly chocolates or vegetarian or clean. And the best part, this pure healthy chocolate is ethically sourced. So how exactly is eating chocolate helping me? This is what I do every day. I start with a wellness protein shake made with this healthy chocolate. I make mine with almond milk every morning and this gives me the energy to get going in the day. It is something I have learned not to skip. I bet you are wondering how I “Learned” not to skip it. Well it goes like this. I had been eating the healthy chocolates for awhile and they were coming out with the new shake to lose weight, thought it would be helpful for my fibro symptoms by losing weight so I tried it. What I did not understand was that it would quickly start helping my fibromyalgia symptoms. Well I had only ordered a certain amount to try it and ran out. At the time it took over a week to get more delivered-I thought I would die! I stayed in bed for days. It was not a good time. I really just don’t skip it at all and I bet you know I always have a little extra so I don’t run out. I don’t take chances! Plus I don’t want my friends to run out either! I take it on vacation, on cruises, pretty much wherever I go. It helps me THAT MUCH! So the rest of the day I eat chocolate along with my meals or for snacks. During a day I eat 3-5 pieces of chocolate. I don’t feel guilty as these are really good for you and are just 30-35 calories a piece. 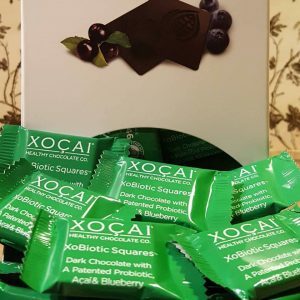 I alternate between Xo Love Bites & Xobiotic Squares, my favorites! 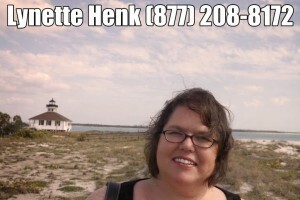 You can reach me, Lynette, at Three Sons Marketing LLC at 941-216-5727 or visit our website at HealthyChocolateFix.com. We are here to help you! PreviousCan You Eat Chocolate On The Nutrisystem Diet Plan?